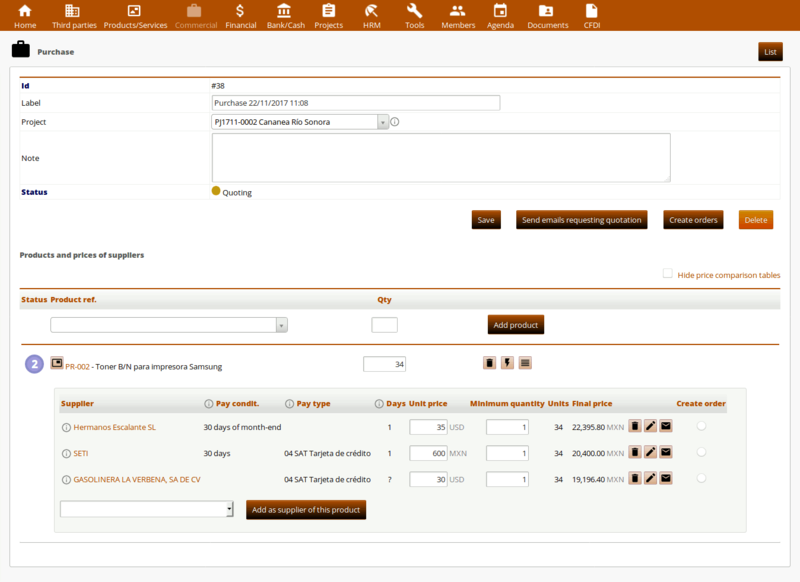 From IMASDEWEB we have developed the module Stock transfers for the opensource project Dolibarr ERP/CRM in PHP. On this guide we present its operation, in case you are already a user or you are thinking of using it. The objective of this module is to offer a more friendly interface than the Dolibarr native to transfer products from one warehouse to another of the company that owns Dolibarr. 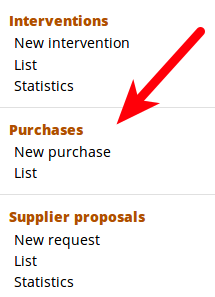 If you have installed the "Purchases" module (also from IMASDEWEB) then in case of lack of stock for the transfer, a button appears to create a new process to purchase the missing stock. Note: version en castellano de este manual de usuario. The objective of this module is to offer a more friendly interface than Dolibarr native to carry out transfers of products from one warehouse to another (warehouses of our company). 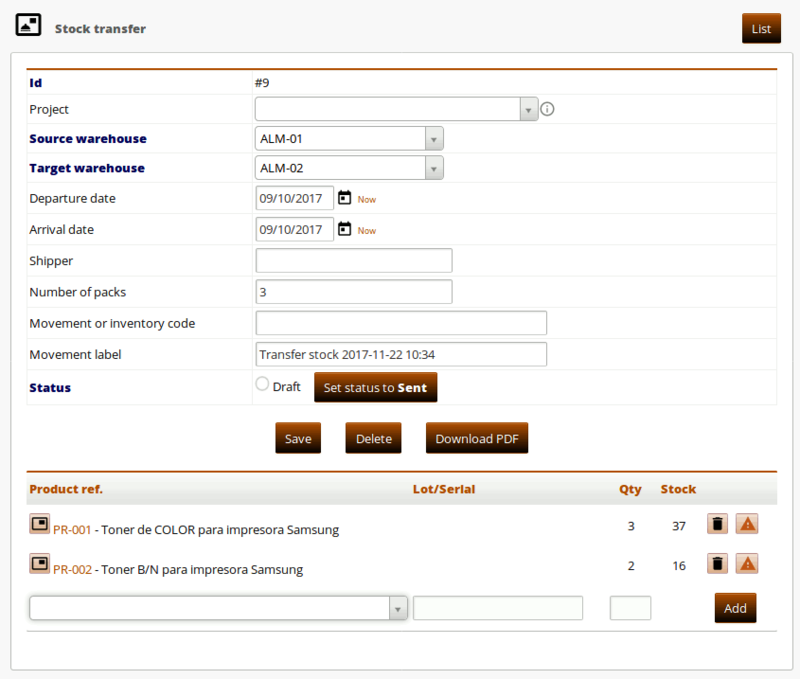 If you have installed the Purchases module (also from IMASDEWEB) then in case of lack of stock for the transfer, a button appears to create a new process of purchasing the missing stock. The module allows the download of a PDF file with the list of products to be transferred and space below for the triple signature of the one who makes the shipment, the carrier and the one who will receive the products in the destination warehouse, usual "delivery note" in this type of transportation. or, from the Dashboard, where you will have a box with the Latest 5 stock transfers. Above there is a first descriptive part of the transfer, where the mandatory fields are always the Source warehouse and the Target warehouse. Optionally you can associate this movement of stock to a Project that you have created in Dolibarr (if you have activated the Projects module). The Departure and Arrival dates will be mandatory when you want to change the status to Sent or Received, respectively. At any time you can download a PDF that will be useful for the transporter to carry it and sign it when delivering and receiving the merchandise. While the state continues in Draft you can add more products to the transfer. The Stock column shows the quantity of product in the Source warehouse. In the case that it is lower than the one you need to transfer, an alert symbol will appear in that column. Also, as long as there is not enough stock for all the products, you will not be able to change the status of the transfer to Sent. If the quantity of stock indicated by that column does not correspond to what is actually in the warehouse, you must make a stock correction, following the native function of Dolibarr for that purpose. But if that amount of stock is really correct, then you must Go shopping to increase your stock in the warehouse of origin and proceed with the transfer. In any case, the Stocktransfers module makes it easy for you. In the first case, you see that there is a button for each product line with the alert symbol that when you click on it opens another browser tab, just the Dolibarr form to create a Stock correction for that product. You must indicate the Warehouse in which you want to correct the stock, select Add in the selection list, and indicate the Number of units to be added. Beware: you have to look at the table that appears below the form, because it tells you the current number of pieces for each store. In our example: 37. So if after having counted in the warehouse it turns out that there are 57 pieces, you must make a correction to add the difference: 20 pieces, in our example. Once you have generated that stock correction you must refresh the page of the transfer so that the stock numbers are updated. 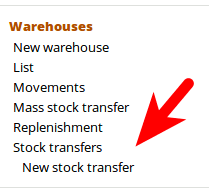 As we have said, if the reason for the lack of stock is not an error, but simply you need to buy some units before you can start moving to the other warehouse, then the Stocktransfers module makes it easy for you if you have installed the Purchases module (also from IMASDEWEB). If not, you simply follow the usual channels in Dolibarr to place orders with our suppliers to supply us. In addition, as usual in the Purchases module, it will show you the existing prices of the suppliers that supply you with these products, all prepared to request quotes - if necessary - or place orders. Note: If you do not know about the Purchases module, it will be helpful to read the User Manual that we have published here. Once you have the necessary stock of all the products to be moved, you will see the button Set status to Sent, just press it to change the status of your transfer. The system will force you to fill in the Departure date. Once the status has changed to Sent, the Set status to Received button will appear, which again will force you to fill in the Arrival date. In any case, you will not be able to add more products once stated as Sent or Received, although you will always have the button Back status to Draft. By clicking on the Download PDF button, a PDF document is generated in real time, such as the one shown below, which is customary to print and carry over so that it can be signed by the persons delivering the goods, and by the recipient and the carrier. 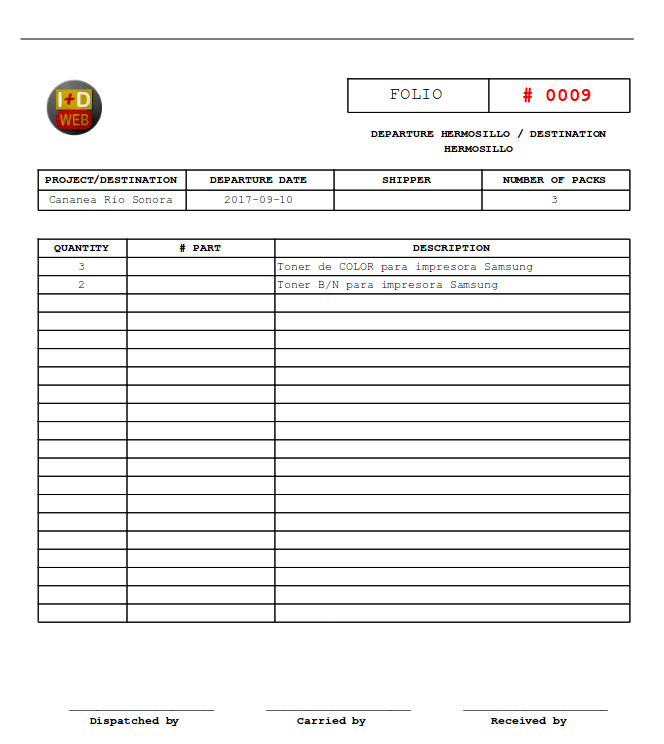 This document collects some of the data that appears on the form, if they were filled in, such as the Project, the name of the Transporter or Shipper, and the Number of packages. 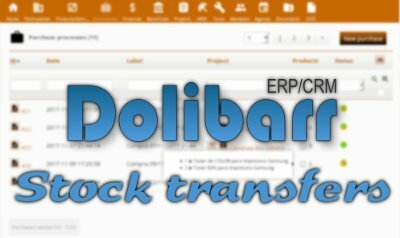 If you are interested in trying the Stocktransfers module in a Dolibarr 5.0.8, contact us and we will gladly give you the username and password. We do not put them here public to avoid unnecessary attacks.